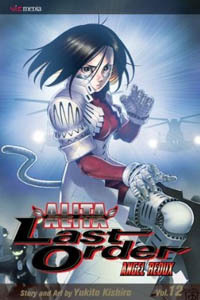 I picked up the latest English volume of Battle Angel Alita: Last Order this week. Aside from the dopey extended ruminations on SPAAAAACE KARAAATEEEE, it was pretty dang good. If nothing else, it was nice to see the main character back in action after entirely too long — and her newfound confidence was a nice contrast to all the spineless dithering of earlier volumes of Last Order. I am not, however, entirely sure how I feel about her new appearance. The armored skirt thing is all well and good, but for some reason she has a tail. Kinda like Goku. I suppose it would be easy to write off this odd new development as a desperate attempt by Yukito Kishiro to pander to catgirl fetishists or some such, but I don’t really think that’s the case at all. No, what it really means is that once you throw a battle tournament into the mix, any manga eventually mutates into Dragon Ball. So I wonder what the deal is with James Cameron’s movie. A close friend actually auditioned for the main role. Does she at least ponder the intrinsic worth of cyborg furries versus human furries? Last Order is really kind of a mess. I almost gave up at Vol. 10, but fortunately the past two books have been back on target, somewhat. I wouldn’t complain if Kishiro wrapped it up and called it a day soon, though. The appeal of the original is that it was a fairly dense story, while Last Order has the stench of being written for its potential to be indefinitely prolonged. I love the original Battle Angel and I Last Order for completely different reasons. Namely, it’s gleefully batshit insane. Seriously, any series which includes Robbie the Robot in a Karate Gi punching other robots gets a big thumbs up from me. Reflecting on this post for a few minutes, I was almost disturbed by the idea that I would be okay with everything mutating into Dragon Ball. Unlike its bloated and mutated offspring, it’s just so charming and aloof. Like Ken said, Dragonball is good. Dragonball Z, not so much so, though it would be hilarious to see a video game devote 6 15 minute cutscenes dedicated to stopping an attack that would destroy a planet, and the heroes only had 5 minutes to stop it. Yeah, the Z.O.T.T. has really kind of messed up the flow of the story too much – it’s just been going on too long. But I keep with the series for the artwork, which is still up to par, and things seem to be moving once again. I’ll be happy to see the story continue on, however it does, if only to make sure that the tournament makes up a smaller proportion of the entirety of the story. This may be a bit off topic but since you guys are talking about comics have any of you read Parker: The Hunter?